Why Are So Many Symptoms of SPD the Complete Opposites of Each Other? There isn’t just one disorder. 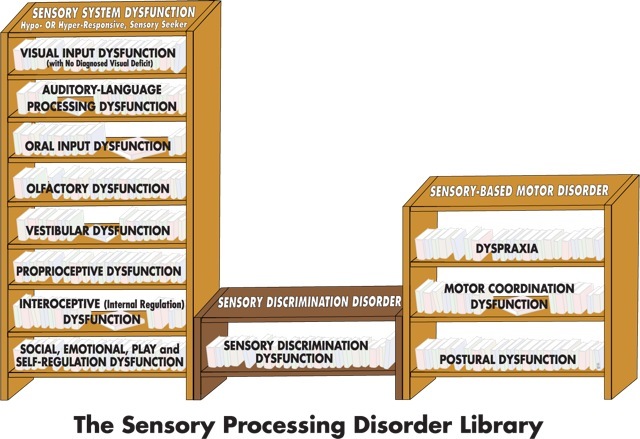 Sensory Processing Disorder is an umbrella term for different dysfunctions. 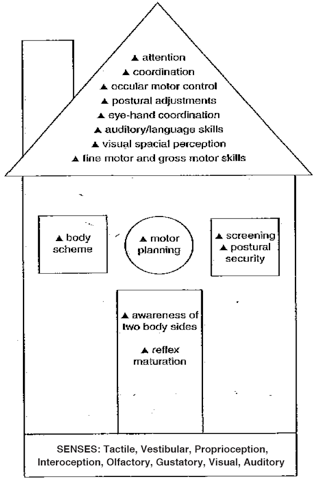 Something can go wrong in any of our eight sensory systems. .
– graphic adapted from Yack, E., Sutton, S. & Aquilla, P. (1998). Building Bridges through Sensory Integration. The Vestibular system contributes to balance and orientation in space. It signals us about the movement and position of our heads relative to gravity. For example, the vestibular senses help us maintain our balance, posture, gaze stabilization, spatial orientation, etc. The Proprioceptive system (sometimes abbreviated as “prop”) senses the location, orientation, and movement of our muscles and joints. Proprioception informs us of the relative position of neighboring parts of our body, and the effort used to move body parts. For example, even if we are blindfolded, we know through proprioception if our arm is above our head or hanging next to our side. The Interoceptive system interprets our internal responses to let us know what our organs are feeling. Its purpose is to guide our body’s regulation, including hunger, thirst, fatigue, temperature, heart rate, respiration, elimination, etc., so our bodies stay in balance. For example, if our body needs energy, we feel hungry, so we eat. Interoception also allows us to identify and regulate our emotions. The process of how we make sense of the information coming in from all eight of our senses is called Sensory Integration. When everything goes right and our brain processes all the input efficiently, we are properly oriented, able to pay attention to input and filter out unimportant information, and we function well in the world. Unfortunately, everything doesn’t always go right. When SENSORY REGISTRATION goes wrong, someone can be either hyper (over) OR hypo (under) responsive to an input from any of the senses. Over-Responders respond to too much. They view things as threatening, are very rigid in their routines/behaviors, and often over-react. Under-Responders need more input to respond. They may not seem to pay attention, or even not respond at all. When SENSORY INTERPRETATION goes wrong, someone can be either hyper (over) OR hypo (under) responsive to input from any of the senses. Over-Responders may be quick to avoid input because of previous negative experiences. They are not receptive to trying new things, etc. Under-Responders may not learn from previous experiences because the input wasn’t registered. When RESPONSE ORGANIZATION goes wrong, someone can be either hyper (over) OR hypo (under) responsive in his/her response (reaction to input). A response can be physical, cognitive, or emotional. Over-Responders may respond too intensely in physical and emotional ways; they are not able to rationalize an appropriate response. Under-Responders may not respond at all because they are not aware of the input or they may not know how to respond. 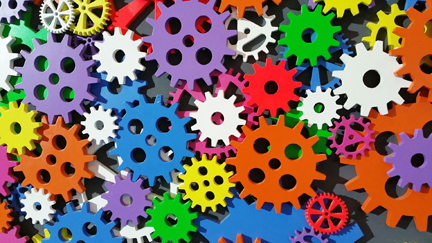 Inefficiency in any of the above steps can cause RESPONSE EXECUTION to go wrong. Response execution depends on a person’s ability to register input, process it correctly, and motor plan an appropriate response. And thus the process begins again in a loop fashion. There are three categories of sensory disorders: Sensory System Dysfunction, Sensory Discrimination Disorder, and Sensory-Based Motor Disorder. 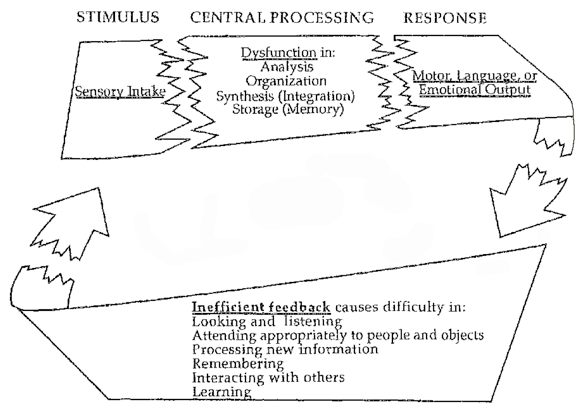 Within these three broad categories, dysfunction sub-types can occur related to one or more of the eight senses. As you build your backpack of sensory strategies to use in everyday situations, you’ll find “books” from this library that are useful in understanding what your child is experiencing, and how you can help. The more you understand, the better you can advocate for your son or daughter. 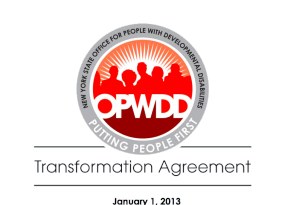 In the next post, we’ll discuss the categories in the SPD Library, and after that we’ll move into discussing how OT can help no matter what type of processing disorder your child has. Do you feel you have a good grasp on the type of SPD your child has been diagnosed with? Please share your thoughts in the comments section below. Also, let me know there or via email what topics you would like to discuss or hear more about.